Provide comfort for the family of Jose S. Rangel with a meaningful gesture of sympathy. Jose S. Rangel, 80, of Andrews passed away on Saturday, February 9, 2019 in Lubbock. Family and friends will gather to celebrate his life at 10:00 AM Thursday, February 14, 2019 at Our Lady of Lourdes Catholic Church in Andrews with Rev. Anthony Franco officiating Interment will follow in the Andrews North Cemetery under the personal care of McNett Funeral Home in Andrews. A Rosary service will be held at 7:00 PM Wednesday, February 13, 2019 at McNett Funeral Home Chapel. 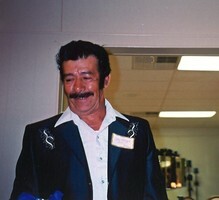 Please celebrate the life of Jose S. Rangel by visiting www.mcnettfuneralhome.com. 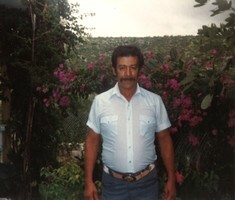 Jose was born in San Luis Potosi, Mexico on February 18, 1938 to Rito and Maria Rangel. Jose came to Andrews in 1972. He enjoyed being a farmer, he also worked for Kirby for 26 years before retiring in 2002. He loved his family and enjoyed being with his kids and grandkids. Jose loved to go dancing, and he loved to travel. He was preceded in death by his parents, Rito and Maria Rangel. He is survived by his wife Rosa of Andrews, eleven children Bernarda Castillo and husband Esteban, of Mexico, Rosa Rangel, of Mexico, Reina Rangel, of Andrews, Belen Rangel, of Andrews, Concepcion Lopez and husband Benjamin, of Mexico, Maria Alejos and husband Jorge, of Houston, Brenda Rangel and husband Samar Garcia, of Odessa, Luisa Canava, of San Diego, Eliazar Canava and wife Rosa Munoz, of Andrews, Raul Canava and wife Sandra, of Andrews, Saul Canava and wife Esmerelda, of Andrews, seven brothers Sotero Rangel and wife Maria, of Rio Grande City, Gonzalo Rangel and wife Guadalupe of Mexico, Augustin Rangel of Rio Grande City, Pafilo Rangel and wife Marta of Mexico, Mario Rangel and wife Socorro, of Houston, Antonio Rangel and wife Emma of Rio Grande City, and Alfonso Rangel and wife Norma, of Mexico. Jose is a grandfather to 25 grandchildren and 28 great-grandchildren. To send flowers in memory of Jose S. Rangel, please visit our Heartfelt Sympathies Store. We encourage you to share your most beloved memories of Jose S. Rangel here, so that the family and other loved ones can always see it. You can upload cherished photographs, or share your favorite stories, and can even comment on those shared by others. ESX Inc sent flowers to the family of Jose S. Rangel. 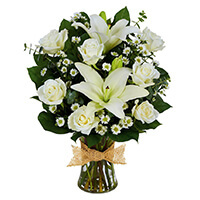 ESX Inc purchased the Tribute Mixed Vase Arrangement - All White for the family of Jose S. Rangel.